12 donuts that this week is going to make we want to eat. Not to mention the baby pictures I need to finish editing and the menu I need to plan for when said company is here. Oh- the class I am teaching is actually about blogging and preserving your memories, etc. So, what is one thing that you wish you knew when you started blogging?? P.S. 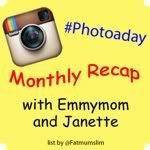 The Photoaday monthly recap will be this WEDNESDAY-- so a day later than usual. More info here. I caught the donuts in there too! ;-) Donuts make everything better. I was whining about how I can't keep up with anything in my post today too. I'm so over feeling behind all the time. Good luck Em! Sounds busy but fun to celebrate with Lucas! Sounds like you have a busy week ahead of you. If I think of any tips I'll try to let you know! I think... if I were to teach a class on blogging and preserving memories, I'd probably teach the ultimate basics, chances of them needing to know how to host or find a host, or register a blog name are all too complex. Stay on the basics, how to setup a free blog, how to upload photos, and the value of it... you can do the value easily by just showing them the living journal archives. Ryan thinks he and Lucas are having a dual party. I am not sure where he got that. In his mind no doubt!! haha. So on Jan 1st, take a break. ;) hahaha. I was about to ask what class you were going to teach. You'll have to share what you taught. Hmmm...I wish I had known about visiting and commenting on other people's blogs. I was totally clueless for about 6 months that other blogs existed...duhhhh!!!! About blogging, I wish someone had told me about watermarking. I think everyone should be aware of the pros and cons to using them so they can decide and not be caught off guard. Dang girl you look like you are going to be one busy momma! That last one up there doesn't sound so bad. :o) The other 11 items seem like a good enough reason to pick up a box of Krispy Kreme's!!! My stress over getting everything done in time for Christmas has already started, so seeing decorations in the stores doesn't really bother me. It seems like as soon as fall starts the countdown to the holidays begins. Yikes! You need an assistant or something!! I think that list requires chocolate... not donuts! Wow you are super busy! But you can do it...you are super mom! Busy lady! I am glad to see you survived.